The third most critical part of your 4x4 bumper and tire carrier is how it directly mounts to the vehicle. Obviously every vehicle mounts in a different patter and location; however, the bumper should always be mounted or reinforced directly to the frame or chassis of the vehicle. This provides a solid foundation to reduce flex and movement within the tire carrier and bumper system. This poses a problem for many vehicles like the Jeep Wrangler that use a very thin cross member (1/16” - 1/8” thick) to bolt the rear bumper to. 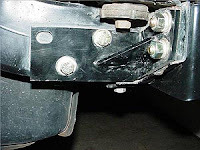 This can be solved by using an ‘L’ shaped frame tie in bracket that secures the back of the bumper to the outside of the chassis vehicle frame. This ensures the bumper is mounted directly to the frame and eliminates significant movement within the overall tire carrier design. If a frame tie in bracket cannot be found for your vehicle, consider fabricating a set up from ¼” thick steel with a welded in gusset for added strength. Mounting directly to the body of the vehicle should be avoided at all costs due to the very thin body metal. Even if you’re using backing plates with the body to increase the surface area, it’s still pulling on very thin material and will eventual tear, oblong, and or fail. If you must have upper mounts for your swing away tire carrier that mount to the body, try mounting through the body and reinforcing into roll cage tubing in that corner of the vehicle if available. Immediately you’ll notice a dramatic improvement within your tire carrier system after being reinforced directly into the frame/chassis of the vehicle. Now you should be able to hold onto the tire of your tire carrier and try to aggressively shake it back and forth with little to no movement within the entire system. The elimination of this movement and flex has now increased the strength of the entire system, especially the hinge and latch mechanism as it reduces fatigue stress. Installing or creating a pair of rear bumper frame tie in brackets is an easy and inexpensive way to dramatically improve the strength and durability of your entire 4x4 bumper and tire carrier system. Reducing flex and movement within the system ensures durability and longevity as it reduces fatigue stress that would otherwise be loaded on the tire carrier hinge and tire carrier latch system.